The upcoming Intel Core i7-9700K was recently spotted running on an ASRock Z370 Professional Gaming i7 motherboard and was found to have been overclocked to 5.5 GHz on water cooling. 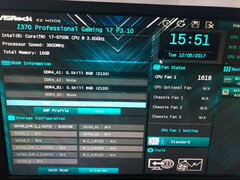 The overclocked Core i7-9700K showed impressive Cinebench performance scoring 250 in single and 1827 in multi-core tests. We are still a couple of months away before the upcoming Intel 'Coffee Lake-S Refresh' CPUs are made official but new information about these chips does keep popping up occasionally. While we've already reported about the Intel Core i9-9900K hitting 4.7 GHz on all 8 cores, we're now seeing its sibling, the Core i7-9700K, hitting 5.5 GHz on all cores on water cooling. The Core i7-9700K is an 8 core 8 thread — that's right, no Hyperthreading — 95W part with 12 MB L3 cache that belongs to the 9th generation family dubbed 'Coffee Lake-S Refresh'. The Core i7-9700K has a base clock of 3.6 GHz and a single-core maximum turbo of 4.9 GHz and up to 4.6 GHz all-core turbo. 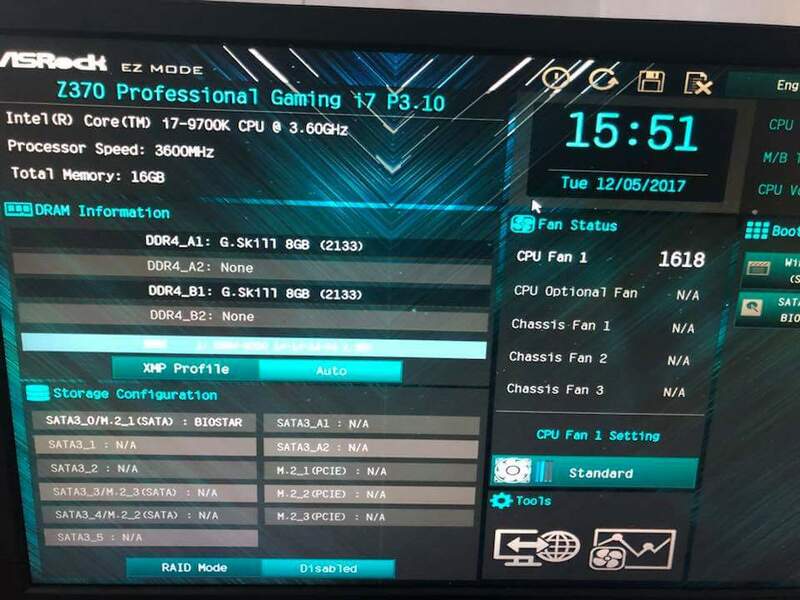 A shot of the BIOS showing the CPU running on an ASRock Z370 Professional Gaming i7 motherboard has surfaced on the web. 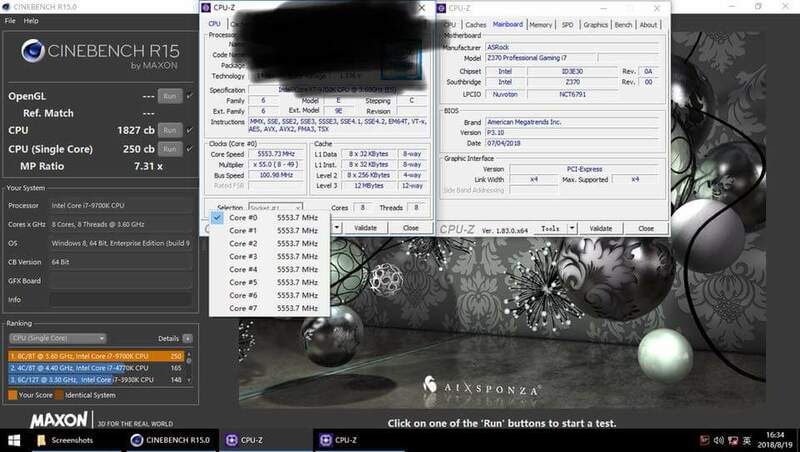 We see the BIOS reporting the CPU base speed as 3.6 GHz and that it is paired with G.Skill dual channel 16 GB RAM. Apparently, the chip was shown to attain 5.5 GHz on water cooling. As shown in the Cinebench R15 screenshot below, all 8 cores could hit 5.5 GHz resulting in a single-core score of 250 and a multi-core score of 1827. Those are good numbers but the overclock was achieved at 1.536V, which is a bit on the higher side. Also, it might be difficult to sustain such speeds for longer periods at that voltage unless of course, one uses LN2. For perspective, the Core i7-8700K scored 193 in single and 1380 in multi-core at stock speeds. It's a bit premature at this stage but just going by these numbers, we do see about 22-25% improvement over the previous generation albeit at a very unconventional overclock. If we were to take a guess for a ballpark number without overclock, it would be somewhere around 20%. Then again, we will have to wait for actual benchmarks to ascertain whether the new CPUs are a worthy upgrade or not. The lack of SMT, however, can be a potential hindrance to the Core i7-9700K's multi-threaded capabilities. Intel could very well be positioning the Core i7-9700K as a gamer-first CPU but we'll get to know that in the weeks leading up to release. As always, take these leaks with caution. An intriguing aspect of this leak is, while the BIOS information showed the base clock and RAM configuration correctly, the date displayed in the BIOS is in December 2017. The date shown in the Windows taskbar, however, seems more recent at August 2018. The date could have been wrongly set in the BIOS but then it should have reflected in the Windows date as well. The reason for this disparity is anyone's guess.